This will be a delight, fellow Almanackers. 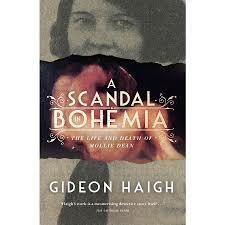 Renowned journalist and author Gideon Haigh will be launching his latest book, “A Scandal in Bohemia” at the Victorian Archives Centre in North Melbourne this month. A Scandal in Bohemia looks at the untimely demise of intriguing 1930s writer, Mollie Dean. Gideon takes on her tale in a true-crime fashion, unearthing a life ephemeral that society has attempted to bury. Booking is not necessary – simply arrive on time on the night.